MEDALLION: Replica of ancient Chinese coin (square within a circle shape) with dragon and phoenix on one side and Chinese calligraphy on reverse. ACCENTS: Cinnabar carved with the ancient Chinese Shou for long life, black agate hexagon tube and small rock quartz crystal ellipses. COMMENTS: Prosperity celebrates all the good things that we have in our lives. 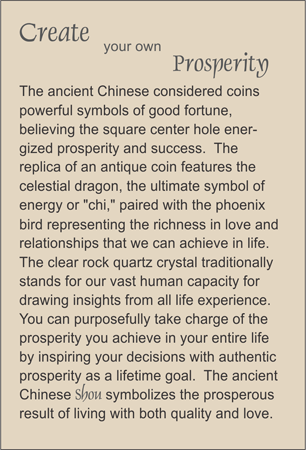 Scroll down to see other TRULYHUMANmedallions with this Replica Chinese Coin.